This Herschel image shows a hole in a Milky Way dust cloud. 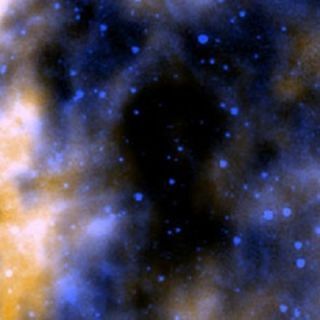 Clouds of cold dust in the Milky Way come in unpredictable and complex shapes, making it difficult for a computer to find holes threaded in these dense patches of dust. The human eye is actually much more discerning in spotting the gaps, and astronomers are turning to citizen scientists to help do just that. Images from NASA's infrared Spitzer Space Telescope showed that there were dark spots in the middle of bright clouds of gas and dust in our galaxy. These blotches were thought to be dense clouds of dust simply too cold for Spitzer's cameras to pick up. And scientists expected far-infrared light observations from the Herschel Space Observatory — which can see much colder dust than Spitzer — to reveal these dark regions glowing brightly. But Herschel data suggested that these spots were actually just holes. "We were surprised to find that some of these dark clouds were simply not there, appearing dark in Herschel's images as well," Derek Ward-Thompson, director of the Jeremiah Horrocks Institute for Astrophysics in England, said in a statement. But mapping out these unexpected holes is a tricky task. "The problem is that clouds of interstellar dust don't come in handy easy-to-recognise shapes," he added. "The images are too messy for computers to analyze, and there are too many for us to go through ourselves." Astronomers who use Hershel, Ward-Thompson among them, teamed up with citizen science portal Zooniverse to make images of our galaxy available online for the public to comb through. A tutorial shows how to tell the difference between a hole and a cloud, explaining that while in the visible light images, it can be difficult to distinguish between interstellar dust and a hole, certain infrared data helps illuminate their differences. All volunteers must do is decide if an image presented shows a glowing cloud, a hole in the sky or something in between — and the site gives examples of each. The initiative is part of the Milky Way Project, which has already created astronomy's largest catalog of star-forming bubbles since its inception two years ago.